If you are an author who is looking to building your own audience, then you want to make sure your author site is fully optimised for list building. 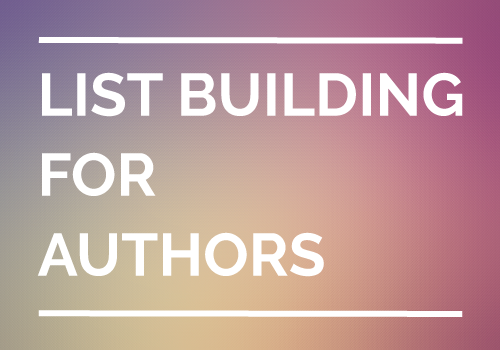 But before I share the 17 list building tips, allow me to remind you the real purpose of list building is to build a sustainable author-audience relationship. If you don’t hold a correct mindset in building your list the right way, then regardless of how much you optimise, it is not going to take you very far. People may join your list fast but they may also unsubscribe from you very soon. So now you know, you shouldn’t start building your email list without wanting to do good for your audience. And you certainly can’t start building your email list without an opt-in form. Don’t worry too much about how fancy it looks if you are just starting out, but make sure you stick close to these rules as much as possible while building your opt-in form. 1. Clear headline. You might think people would want to subscribe automatically, but really, why should they? Offer a good reason for why they should join and what they will get by joining your list, then make it clear in your headline and short description. 2. Clear incentive. 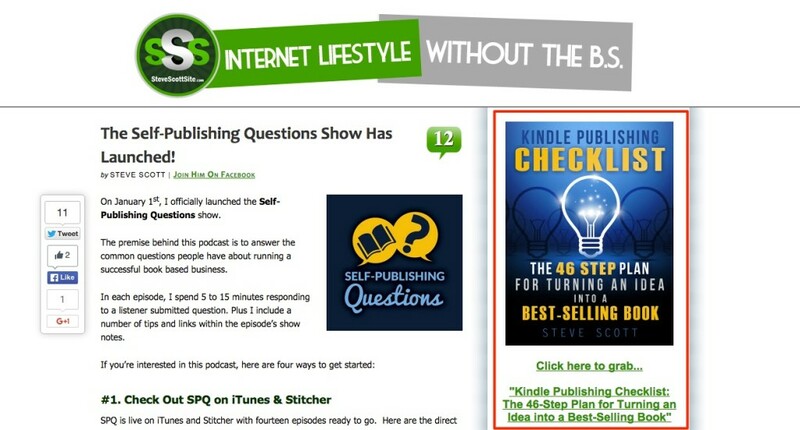 You may still get subscribers by offering nothing else but a “follow this blog” message. But you are losing out the chance of building a larger list because nowadays people often land on a website to look for something specific for themselves. Simply “follow me” is not an attractive offer unless you are already a well-known name, as compared to one specific incentive that your audience is highly interested in. 3. Clear call to action. You might expect people know what they should do, but they don’t. Even if they do, they don’t necessary bother to take action the moment they see your opt-in form. You want to make your instructions clear so they know exactly how to access your materials, and also trigger an immediate response at the same time. Now I have prep you ready. Let’s dive in for the real meat. Tip #1. Add an obvious feature box. Ask yourself, is my opt-in form obvious on my website? If your web visitors don’t see your opt-in form, they don’t subscribe. Simple as that. 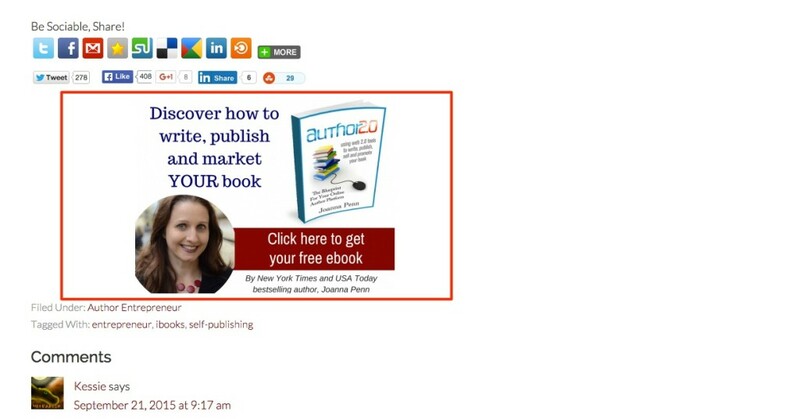 One common mistake that I’ve seen authors make on their websites is that their opt-in form just isn’t obvious. Either the email signup form is too small and distracted from the many links and banners loaded on the sidebar, or it is hidden in one corner rather than appearing on the high-converting places. Make your opt-in form obvious so your web visitors can’t miss that. Period. Tip #2. 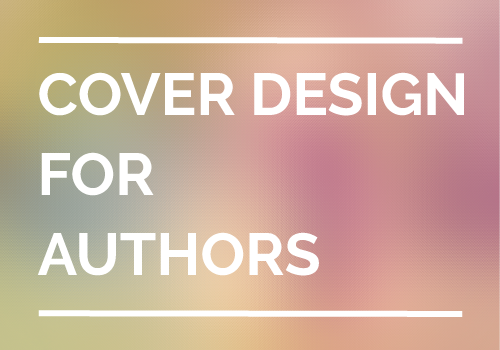 Make a dedicated book landing page. Don’t have a website but still want to build your list? Build a simple landing page for your book, put up an email signup form, give the first chapter away and you are all set to start building your list! If you have a long sales page, make sure your opt-in form appears multiple times across the entire page. For example, you may put one at the top, one in the middle of the page, and one near to the bottom of the page. Tip #3. Make a Coming Soon landing page. What if your book is not ready? Guess what? It’s still a perfect time to build your list because by the time you have written your book, you already have your own audience to promote to! In 2008, Robert Kiyosaki asked his readers to sign up to his list and watch him write his book “live” online. Whenever he finished a new chapter, he would send it out to his subscribers to read and they loved it! You may not need to do the same but it is still a wise step to build your list even before your book is ready. You can put up a Coming Soon page and ask people to join your waiting list and send out periodical updates about your writing progress. Your list is a group of beta readers who show interest in your work and you may ask feedback, reviews or even get them to help promote your book when it is ready to launch! Tip #4. Add an opt-in form to your navigation bar. What is the one thing that stays static and appear on almost every page on a website? But most authors end up stuffing it with way too many distracting links, rather than insert a simple email signup button to convert more visitors to subscribers. Only include the essential and high-converting links, remove the rest and insert an email signup button on your menu bar. Look at the before and after. James Altucher removed a few links and made his opt-in signup form stand out on his menu bar. Tip #5. Add an opt-in form to your blog sidebar. Most authors blog and most blogs have a sidebar. If menu bar is one of the first thing your visitors will look at intentionally, then sidebar is probably another because we are trained to use it for exploring the site further. But bear in mind that a long and crowded sidebar is not necessarily doing anything good, so keep your opt-in form at the top of your sidebar if you want to get more subscribers. Let me show you a good example. 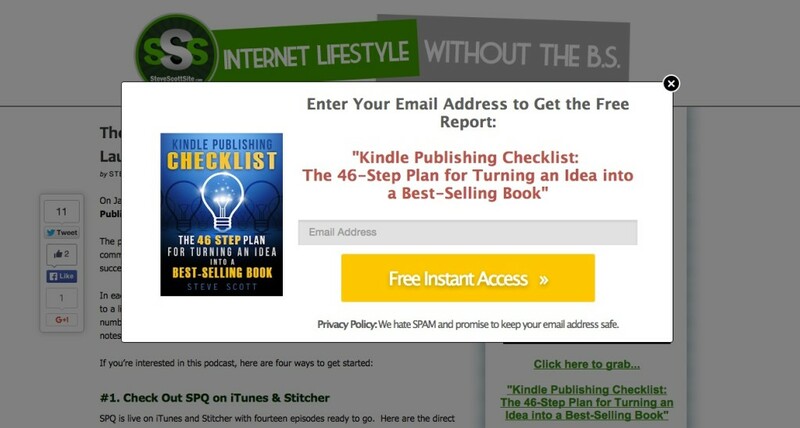 Steve has a well-built opt-in panel with clear signup incentive (Kindle Publishing Checklist) and call to action (Click here to grab). Clicking on the link triggers a lightbox pop-up where the visitors can enter their email addresses immediately, without having to be directed to another page. This may seem small but if your website’s loading speed is slow, some people may give up the idea while waiting for the page to be loaded. Tip #6. Make your opt-in form on sidebar “sticky”. If you already have a well-designed opt-in widget on your sidebar, that’s great. And why not make it “stick”? One problem with long blog posts is that you may lose your subscribers if you only put the sign up form at the top of the sidebar. The form becomes out of sight once your readers scroll down to read. To solve this dilemma, you might want to make your opt-in widget float and follow your scrolling. This keeps your opt-in panel within your readers’ radar, even if they have to scroll down to the bottom of the site to read. This is exactly what Pat Flynn has done on his blog. Pay attention to how the widget “sticks” on the sidebar all the time. Here is a free WordPress plugin and 1-minute tutorial explaining how to create one for your own. Tip #7. Add a Hello Bar across the top of your website. Have you seen a small bar above the menu that spans across the top of a website like this below? That’s what is known as a Hello Bar (or Smart Bar or Viper Bar depending on which platform you use), it is designed to grab your web visitors’ attention and prompt them with a call-to-action without being obnoxious. This works as if you are saying to your web visitors, “Hello! Welcome to my website, now this is something fun that you might be interested in checking out.” and gently point them to a page you want them to see. In this case, it’s going to be your landing page to join your mailing list. You can also ask your visitors to sign up your list directly using this little bar, as it can be designed to float and stay at the top of your site all the time. Tip #8. Add an opt-in form to the bottom of your post. If someone spends time to read your post to the end, you’d bet that he is likely to become your subscriber if given the chance. Why not? He has already finished reading your content, and probably ready to leave his comment at the bottom of your post. That place between the end of your post and before the comment section is a high-converting place to turn your readers into subscribers. Tip #9. Make your opt-in incentive post-specific. If you know some of your articles are receiving high traffic, then you may want to leverage on them in getting more subscribers. What I mean is that you want to “upgrade” your content by creating extra values that complement to your article, such as checklist, cheatsheet or template and give it away as an opt-in incentive together with the post. This works because you already knew the readers love your article, and by creating something to go-with-it just make your opt-in request irresistible! Step 1: Find one popular post on your blog. Your Google Analytics results should tell you what to pick. Step 2: Create your go-with-it freebie. Brainstorm a way to increase its value by repurposing the content. For example, if you are a professional fashion stylist who has written an article about the process of shopping for a perfect jeans, then you may turn it into a downloadable PDF cheatsheet. Step 3. Put up an opt-in form in your post and give it away! Tip #10. Add a “How Can I Help You?” opt-in section to your homepage. For most websites, homepage is often that most visited page and the first page people land on. It is a page that gives a snapshot of what you and your entire site is all about. Therefore, it is definitely worth the efforts to maximise its use in getting more subscribers. First of all, you should really insert an opt-in form on your homepage if you don’t already have one right now. Seriously, go back to Tip #1. Then, summarise how you can help your audience in two to three ways and create what I call… right, a “How Can I Help You?” section. Ramit Sethi is a well-known expert in helping people to start their own businesses or land their dream jobs. Those are what he can help. Each column in the section is designed to target a specific group of audience. By clicking on any of the three buttons will bring his audience to a dedicated landing page where he gives away his guides to build lists. Tip #11. Add an opt-in form to your About page. If you are like me, one of the first pages you will want to checkout is the About page because we all love to read other people’s stories! Even a short About page tells me the man behind the computer screen is somewhat genuine, let alone a well written piece about the adventures only you, your brand or your business have gone through. So, if Google Analytics shows that your About page is one of your most visited pages, don’t be surprised, but make sure you put an opt-in form there! Tip #12. Add an opt-in to your Start Here page. As you write and publish more articles, it is going to be harder for your audience to read your blog effectively. This is especially intimidating for your new readers. On one hand, they want to explore your site to see if there is anything that is in it for them; on the other hand, they may get overwhelmed and eventually drop out from your site if they don’t find their way. This is where a Start Here page will help. You show them a clear path by pulling all the must-read articles from your blog and putting them in one page for your readers’ convenience. I’ve said it before, the first thing you should do is to make your opt-in form obvious for your audience to sign up. In the other words, places on your website that receive more eyeballs are where you should consider putting up an email sign up form. A Start Here page is one of those pages. 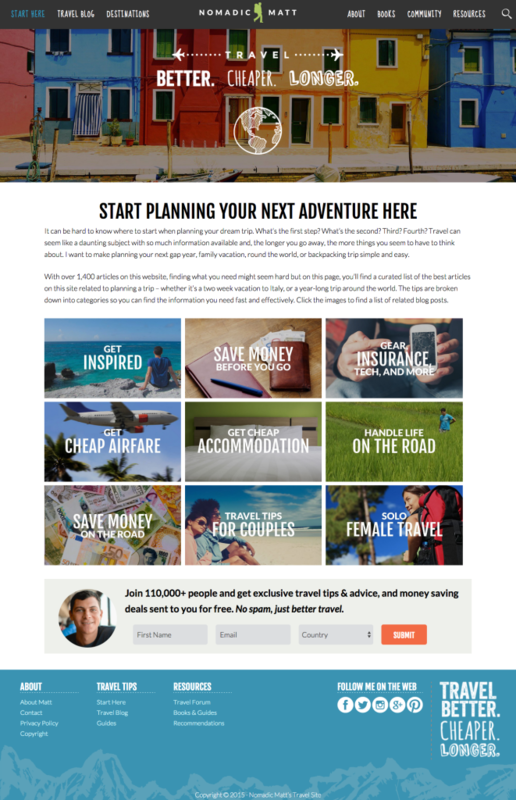 Matthew Kepnes, a travel expert blogger and New York Times bestselling author, had his site NomadicMatt.com newly redesigned. His Start Here page demonstrates what I mean visually. Tip #13. Add an opt-in to your most popular page. You may not have an established blog yet to show a clear process, or your individual posts are loosely related to one and another. The idea in Tip #12 still holds. You still want to create a high-converting page where you can leverage on to build an email list. Instead of creating a Start Here or The Best Of page, you are going to create a Most Popular page. 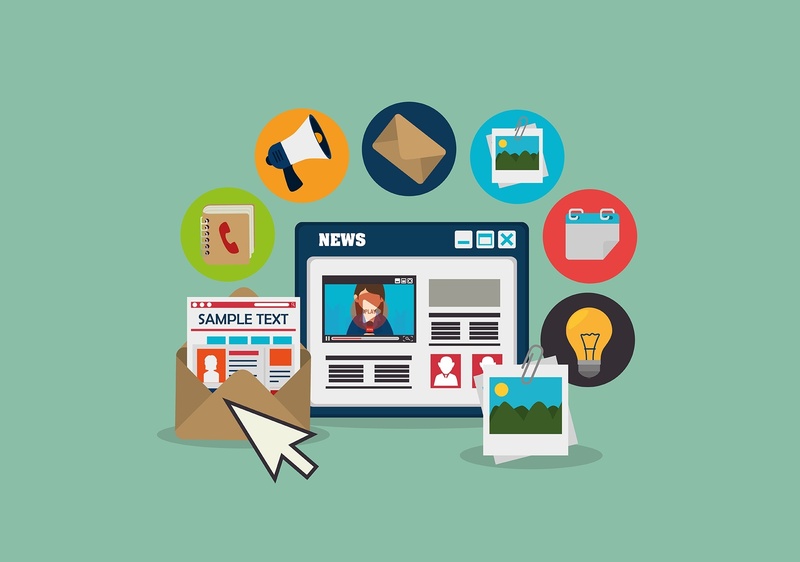 Step 1: Identify 3 to 5 most popular posts (most viewed and shared) on your website. Your Google Analytics results should tell you what to pick. Step 2: Create a new page to feature your most popular posts. Step 3: Put up your opt-in form there! Tip #14. Add an opt-in form to your Thank You page. Well, it’s literally a page to show gratitude to your audience after they subscribe or buy something from you. When someone has just bought or subscribed to access something they want, he is excited and eager to get his hands on it. This makes Thank You page one of those pages your visitors HAD to see no matter what, because they WANT to access whatever you promise to offer almost immediately. Therefore, it makes sense to utilise your Thank You page for list building by offering an unadvertised or surprise bonus to sweeten the opt-in process, while adding more subscribers to your email list at the same time. Tip #15. Add a Welcome Gate to your website. A Splash page was once designers and website owners’ favourite in the old days. It is a fast loaded page your web visitors can see while your site is loading behind, that also allows them to view a piece of information (mostly graphic animated, like flash) without scrolling before they enter the homepage. A Welcome Gate is similar as it precedes your homepage but only better. When your visitors come to your website, they are going to see a Welcome Gate where you gently prompt him to subscribe first, before they access your homepage. But what if they don’t feel like doing so at that moment? No problem, your homepage is only one click away. This is good because you take the active move by making list building the first thing before anything else, instead of waiting passively for your visitors to discover your opt-in form and sign up. But this is also not a forced opt-in because they have the choice to leave and continue enter your homepage, even if they don’t want to subscribe immediately. Tip #16. Add an opt-in form to your footer. But studies also show that while most attention from your visitors is given to the top part, people do scroll down the page. In fact, half of the users start scrolling within 10 seconds and 90% within 14 seconds on mobile, according to MOVR. This is how Dr Judith has done it on her website The Book Shepherd. Well, it means you should also consider inserting an opt-in form to your footer! While the majority of your visitors drop out and leave your page half way, those who make it to the bottom display interest in your site. Even if they are just trying to scan your site quickly, they might also be looking for essential information such as contact info which is typically displayed on the footer. Therefore, it is another great place to put your opt-in form there! What else? Like the menu bar, footer exist on every page! Tip #17. Add an opt-in pop-up to your website. People are afraid of using pop-ups on their websites because they are afraid it would annoy their readers and drive them away. However, pop-up opt-in has been proven to be a very effective way in building subscribers, if you use it the right way. Though there are many types of pop-ups – a multi-step pop-up lightbox is something you might want to start with. 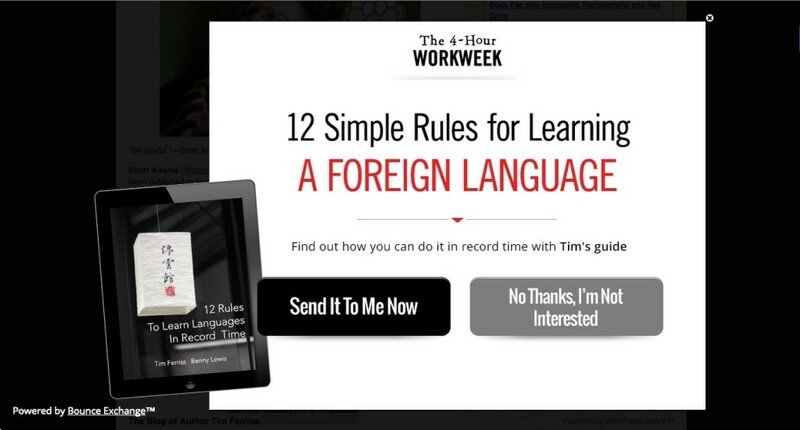 This is a pop-up you will see on bestselling author, Tim Ferriss’ blog. The pop-up appears to be less disturbing because it gives the readers a way out. Instead of making your readers feel that they have been interrupted and forced to join your list, this lightbox acts more like a nudge to remind them the goodies that you are offering, and gives them permission to opt-in or reject. I have just shown you 17 ways to build your email list. The question is, do you need to try all of them on your website, or which one should you start with? If your website currently has none or just one opt-in form, then I’ll strongly suggest you to choose any three tips to start with. You don’t have to do everything at the same time. In fact, it’s not necessary and I wouldn’t recommend that. Once you have at least three opt-in forms on your website, start monitoring your opt-in rate response. Is adding lightbox pop-up a turn off to your audience? Or does a new signup button on the menu get you more subscribers? You won’t know until you try and only your audience will tell you the answer. So, which of the above tips are you going to try out first? Tell me in the comment below. Also, if you know someone who is struggling to build his email list, do me a favour and forward this article to him!